July 20, 2009 — Walls are too often wasted. I mean, sure, they support our ceilings and come in handy for hanging stuff, but it seems like we would want to do a lot more interesting things with what pretty much makes up 75% of our visual content each day. That’s a lot of beige-painted drywall to be assimilating. Which is why we should cover all of them up in murals, I think. Kids, in their purer wisdom, instinctively know this, of course, and crayon-graffiti any blank vertical space they can reach with their short arms. It's also generosity on their part. These blank spaces cry for their voids to be filled, and in our adult miserliness, we merely give them family portraits and light switches. 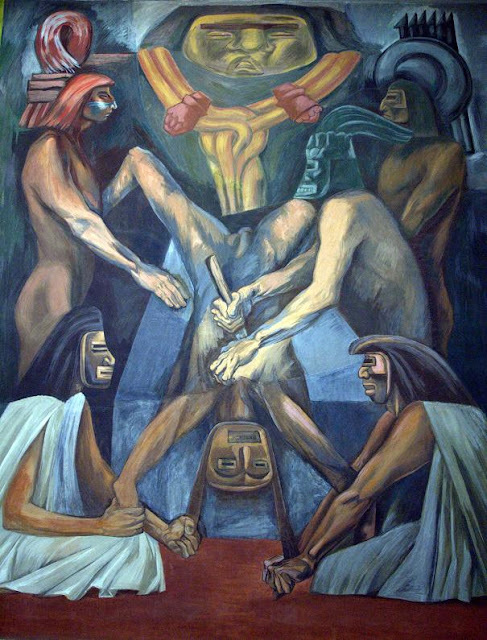 But not José Clemente Orozco. 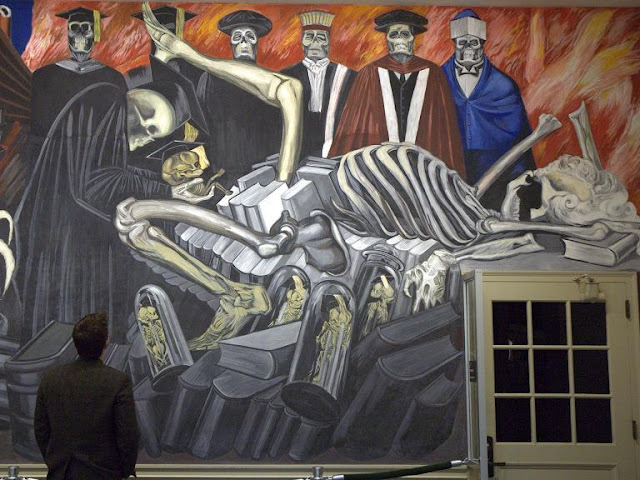 This Mexican-born artist was a master of the mural form. His life spanned the first half of the 20th century and who could paint thrilling and engaging expanses with one hand tied behind his back. The one that he lost in a childhood fireworks accident, actually. Possibly the most impressive example of his work (and one of the most impressive examples of the genre itself) is his The Epic of American Civilization, an indoor mural that wraps around both wings of the large reserve corridor in the Baker Library at Dartmouth College in Hanover, New Hampshire, and takes on the dark history of an entire continent. 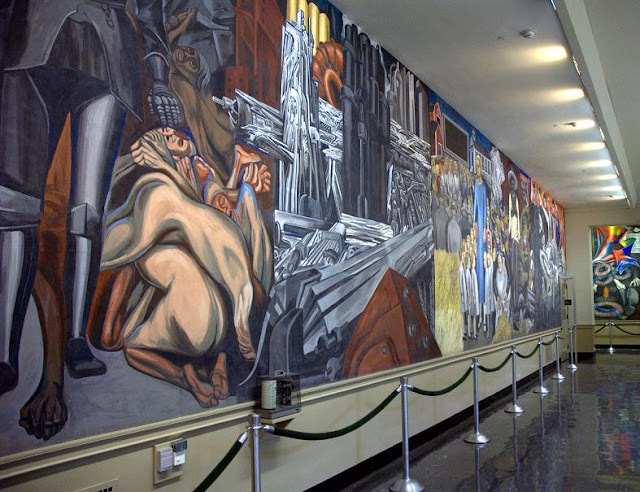 Started in 1932, it took Orozco two years to finish this sprawling work, which is made up of 24 individual panels painted directly onto the wet plaster of the walls. All told, it covers a surface area of approximately 3,200 square feet. You could build a large house in that amount of space, with plenty of area left over for a nice lawn completely thatched in Slip ’n Slides. Now you know a little bit about my dream house. As is evident by the title, The Epic of American Civilization depicts the history of America. Well, one of the histories of America, at least. There are no puffy-sleeved explorers, no powdered-wigged founding fathers, no buckskin-clad pioneers...none of the tropes of U.S. history books. Orozco’s history dedicates half of its size to the rise and fall of the Aztec Empire, spends a few brief square feet on the influence of Spanish and European culture on North America, and then ends with a long, metaphor-strewn meditation on the promises and perils (but mostly perils) of modern industrialized society. 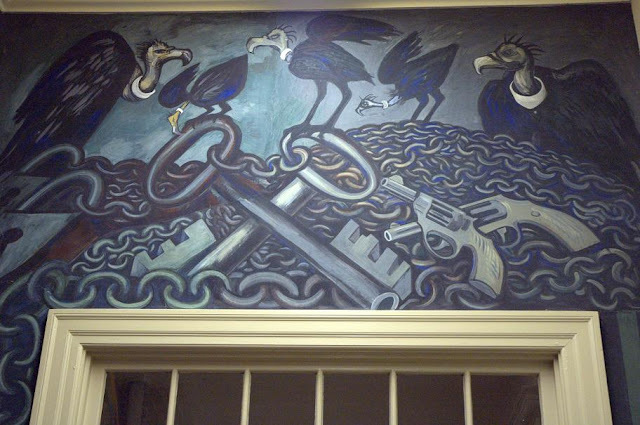 In fact, the entire narrative of the mural is depicted primarily through metaphor instead of literal events. It includes such images as serpent-faced and fire-wreathed pagan gods, sinister-looking machines, Christ with an axe, prophecy-fulfilling knights in faceless armor, and vultures on carrion heaps of chains and weapons, as well as other forbidding scenes (Christ with an axe is a forbidding scene to everybody else, too, right?). 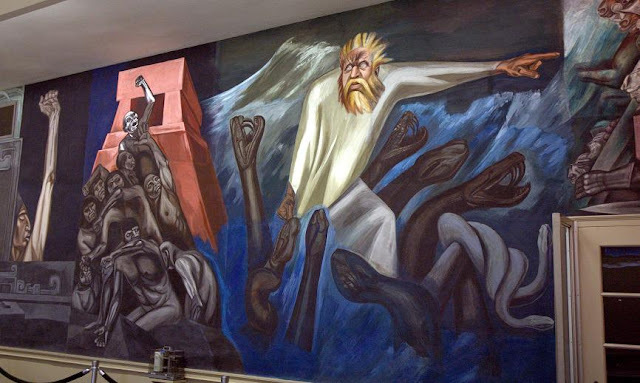 In the west wing, the mythic character of Quetzalcoatl, in both his serpent and a white-robed Moses-like human form, dominates the narrative before departing on a raft of snakes while prophesying the fall of the Aztecs. In addition, many of the panels serve as similarly titled companion pieces, including one in the west wing depicting ancient human sacrifice and another in the east wing portraying the human sacrifice of war. My personal favorite panel is Gods of the Modern World. In it, a skeleton in academic garb delivers a similarly biretta-headed skeleton fetus from a pregnant skeleton awash in books and glass specimen jars filled with other skeletal embryos while more collegiately robed skeletons look on in…well, whatever facial expression skulls are capable of, I guess. What can I say? I like skeletons. Also, it's respectably brazen to have some sort of indictment on institutionalized education permanently decorating the halls of an educational institution, especially when it’s the one that is funding your work. Also, and you might have already inferred this, but every single one of the panels is somehow terrifying, regardless of its subject matter, whether it be something as simple as a Puritan village full of school children (of the damned) or the steel I-beam ribs of an under-construction tower (of terror). 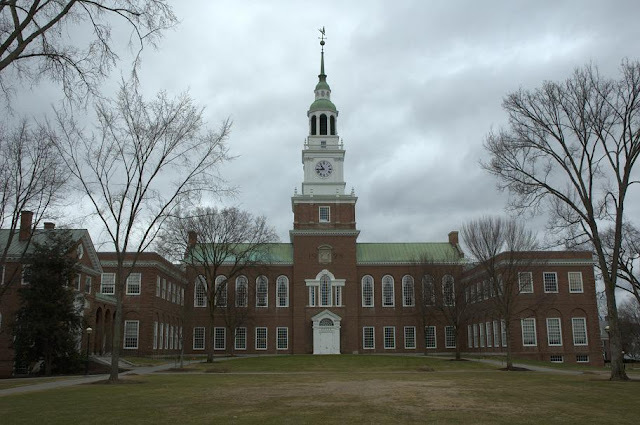 Dartmouth College, with its red-brick buildings and 250-year history, is a grand place and well worth visiting for reasons beyond the mural. But if you do visit for those other reasons, you still have to at least see it. It’s open to the public during the library's regular operating hours, and the reserve corridor whose lowly walls Orozco immortalized is located in the basement of the library. The Epic of American Civilization is also one of the more welcoming oddities that I’ve ever visited. A sign actually encourages photographs, and a beautifully printed and illustrated brochure more worthy of a bookshelf than a scrapbook is available for free and goes into detail about the history and meaning of the mural. We visited the mural on a Saturday morning, so, since this was a college, of course barely anyone was there. In fact, the only other souls present besides the one and a half shared between me and my wife belonged to the librarian who had to be there and a solitary student seated at one of the dozen or so long tables in the room, enviably engaged in gentle study in the midst of all that apocalypse and terror.